The Sprite Editor is used to slice individual sprites from an Atlas or Sprite Sheet. and slice them in to individual sprites. cannot use the sprite editor window at this time. please see the information link below. texture importer in the inspector. Click the sprite editor button to open the sprite editor. 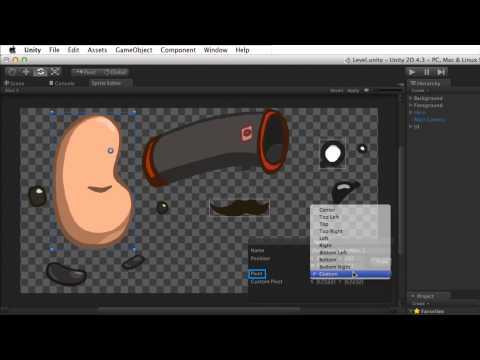 The sprite editor window is a standard Unity window. It can be used and docked like any other window. This will create rectangular selections that define each sprite. by clicking and dragging the rectangle. Click and drag anywhere inside the rectangle to move it. Click and drag any of the corners or edges to resize it. the pivot point for that sprite. with details about the selected sprite. Name is the name of the sprite. is on the image, in pixels. X and Y define the start point of the sprite. measured from the lower left corner of the image. to the lower left corner of the sprite. of the sprite, from the start point. creating the tightest fitting rectangle possible. Pivot sets the pivot point for this sprite. for each corner and the centre of each edge. to be set numerically under Custom Pivot. by slicing the sprite elements from the image. The slice type is either automatic or grid. uneven elements, like from an atlas. detected based on the empty space around them. minimum size for each individual sprite. includes presets for each corner and the centre of each edge. or adjust it visually in the editor. sprites in the sprite editor window. that already exist with new sprites. while retaining and adjusting existing ones. changing any sprites already created. to slice the image in to individual sprites. After slicing, each sprite can be edited individually. could cause the sprites to be cut out unevenly. Pixel Size sets the size of the grid in pixels. to all sprites when they are sliced from the image. in the sprite panel, or adjust it visually in the editor. After slicing each sprite can be edited individually. Or discard any change by selecting Revert. fine details when manually adjusting edges. The zoom slider controls the zoom when viewing the image. the asset will update in the project window. click the turn-down arrow to see any children. Each child represents a useable sprite from that image. or used sequentially as animations.